Today I was working on someone’s computer and noticed that this particular person had a candy bowl on her desk that was stocked full of Reeses cups, Peppermint Patties and Hershey’s Nuggets. I am not exactly sure why but this irritated me. I take that back…I know why it made me mad. It drives me crazy when a skinny person keeps candy around and doesn’t eat it. Good candy too, not Smarties or Jolly Ranchers. It's especially annoying when just this morning (for the second time this week and it's only Tuesday) you've told yourself "it's time to get back on the old diet." What kind of person can stare at a bowl of peanut butter cups all day and not eat them. Is it some kind of subliminal message to the world about will power? Is this some kind of inspirational lesson for us fatties? “Look at me, I’m so skinny and can pass on this candy all day long.” “I can type emails click clack click, and make spreadsheets with my skinny fingers and I don’t touch this candy.” I mean why is this bowl there anyway if no one is going to eat it? Is it for visitors? 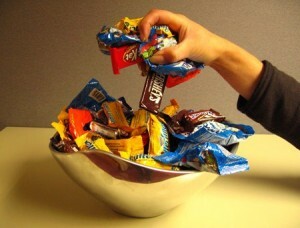 Who is going to reach in and take the candy in front of her? Not me, I have to sneak my office candy so no one passes judgment on me. Nope, I think the only people who will eat her chocolate are other candy bowl loving skinny people. I know this is just my issue. 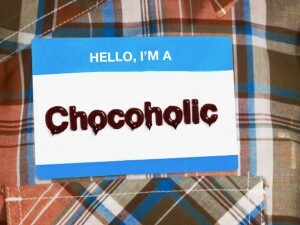 Most other people are normal around chocoalte. This is America after all and if a skinny person wants to have delicious candy just lying around they have a right to do so. I’m just saying the concept is foreign to me. I was only there a few minutes when temptation really started setting in. The smell of peanut butter and chocolate started to make me feel woozy. I fixed her computer as quickly as I could. I had to get out of there fast. Think I'll walk past her office on the way out today…just to check on her…you know, to be sure her computer is working still…and if she's not there (please, please, please) maybe pick up a little something for the road. Copyright © 2012-2017 project midlife All Rights Reserved. Chocolat theme by Mignon Style. Powered by WordPress.